RD Sharma (2017) Solutions for Class 9 Math Chapter 23 Graphical Representation Of Statistical Data are provided here with simple step-by-step explanations. These solutions for Graphical Representation Of Statistical Data are extremely popular among class 9 students for Math Graphical Representation Of Statistical Data Solutions come handy for quickly completing your homework and preparing for exams. All questions and answers from the RD Sharma (2017) Book of class 9 Math Chapter 23 are provided here for you for free. You will also love the ad-free experience on Meritnation’s RD Sharma (2017) Solutions. All RD Sharma (2017) Solutions for class 9 Math are prepared by experts and are 100% accurate. Given below (Fig. 23.11) is the bar graphic indicating the marks obtained out of 50 in mathematics paper by 100 students. Read the bar graph and answer the following questions. (i) It is decided to distribute work books on mathematics to the students obtaining less than 20 marks, giving one workbook to each of such students. If a work book costs Rs. 5, what sum is required to buy the work books? (b) 59% students have obtained marks ranging from 10 to 29. (viii) What is the number of students belonging to the highest mark group? (4) The total number of students is 100 (given in the question). (8) The number of students belonging to the highest mark group 40-49 is 17. (a) The number of government companies in 1957 is that of 1982 is 1 : 9. (b) The number of government companies have decreased over the year 1957 to 1983. (1) The bar graph represents the number of government companies in India during some years. 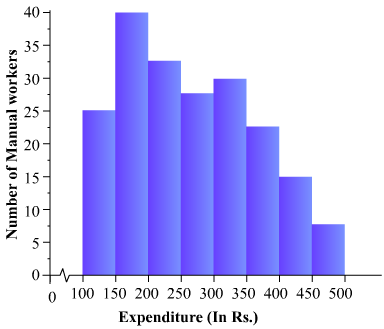 (b) The height of the bar graphs increases over the years 1957 to 1983. 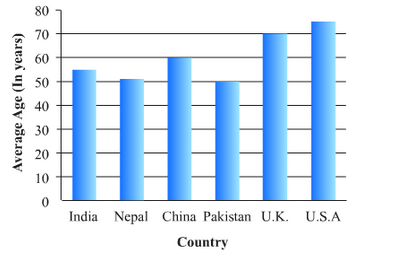 (1) The bar graph represents the production of rice and wheat in different states of India. (2) According to the height of the bars corresponding to rice, W.B. is the largest producer of rice. (3) According to the height of the bars corresponding to wheat, U.P. is the largest producer of wheat. 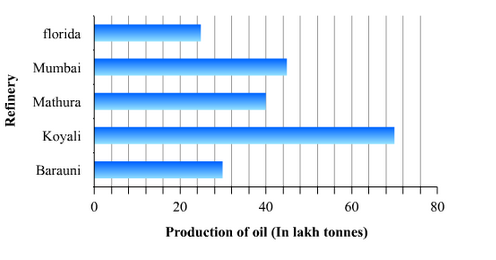 (5) Maharashtra has the minimum total production of rice and wheat, which are exactly 2 + 4 = 6 units. (iii) The school wants to provide a particular type of tonic to each student below the height of 150 cm to improve his height. If the cost of the tonic for each student comes out to be Rs. 55, How much amount of money is required? (e) The number of students in the class having their heights less than 150 cm is 12. (2) The maximum range of height is 164-165 cm. The number of students belonging to this group is 5. (4) The minimum range of height is 140-144 cm. The number of students belonging to this group is 7. (5) (a) The number of students whose heights are in the range 155-159 cm is 9. Hence, the statement is true. (b) The maximum possible height (in cm) of a student in the class can be 164 cm. Hence, the statement is false. (c) The number of students whose heights are in the range 145-154 cm is . Hence, the statement is true. (d) The minimum range of heights of students in the class is 140-144 cm. Hence, the statement is true. (e) The number of students having heights less than 150 cm is . Hence, the statement is false. (f) The number of students having heights more than 154 cm is . Hence, the statement is true. (ii) What was the production of cement in the year 1980-81? (iii) What is the minimum and maximum productions of cement and corresponding years? 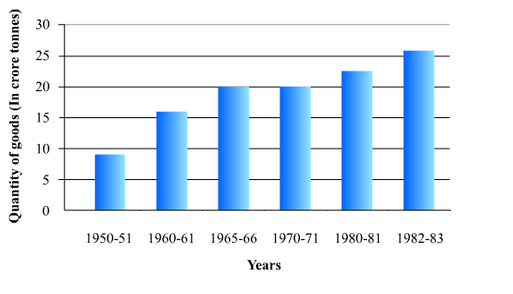 (1) The bar graph represents the industrial production of cement in different years in India. (2) According to the height of the 6th bar from the left, the production of cement in the year 1980-81 was 186 lakh tonnes. (3) According to the heights of the bars, the minimum production of cement is 30 lakh tonnes in the year 1950-51 and the maximum production of cement is 232 lakh tonnes in the year 1982-83. 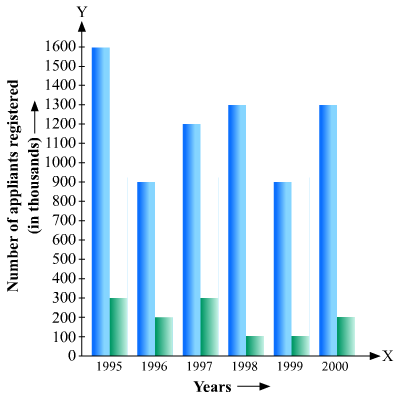 The bar graph shown in Fig. 23.16 represents the circulation of newspapers in 10 languages. (i) What is the total number of newspapers published in Hindi, English, Urdu, Punjabi and Bengali? (ii) What percent is the number of newspapers published in Hindi of the total number of newspaper? (iv) Name two pairs of languages which publish the name number of newspapers. (v) State the language in which the smallest number of newspapers are published. (vi) State the language in which the largest number of newspapers are published. (4) According to the length of the 5th and 6th bars from the top, the number of news papers published in Marathi and Malayalam are same. According to the length of the 1st and 3rd bars from the bottom, the number of news papers published in Bengali and Gujrati are same. (5) According to the length of the 4th bar from the top, the smallest number of news papers published in the language Punjabi. (6) According to the length of the 4th bar from the bottom, the largest number of news papers published in the language Hindi. (7) The languages in which the number of published news papers is greater than or equal to 2500 are English and Hindi. Among the languages Hindi and English, the language in which the number of published news papers is less than or equal to 3500 is English. Hence, the language is English. The number of news papers published in English is 3400. Clearly, 2800 is less than 3400. Hence, the statement is true. (b) The number of news papers published in Telugu and Tamil are 400 and 1000 respectively. Clearly 400 is not greater than 1000. Hence, the statement is false. (ii) What was the crop-production of rice in 1970-1971? (iii) What is the difference between the maximum and minimum production of rice? 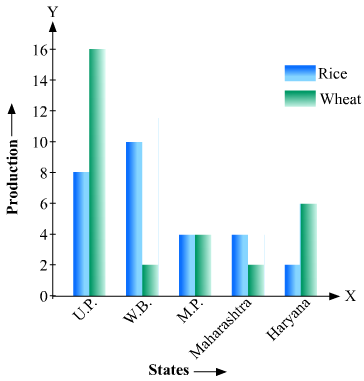 (1) The bar graph represents the production of rice crop in India in different years. (2) According to the height of the 3rd bar from the left, the crop-production of rice in 1970-71 is 42.5 lakh tonnes. (i) What information does it give? (ii) In which part the expenditure on education is maximum in 1980? (iii) In which part the expenditure has gone up from 1980 to 1990? (iv) In which part the gap between 1980 and 1990 is maximum? 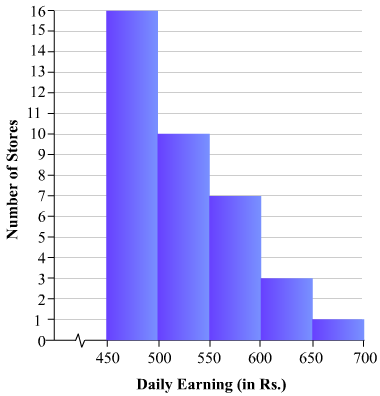 (1) The bar graph represents the public expenditure on education in different countries and sub continents in the years 1980 and 1990. (2) The expenditure on education in Africa in 1980 is the maximum. 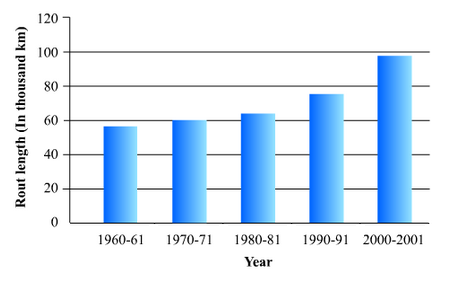 (3) It is clear from the bar graph that in East Africa the expenditure has gone up from 1980 to 1990. (ii) In which years the areas under the sugarcane crop were the maximum and the minimum? The area under the sugarcane crop in the year 1982-83 is three times that of the year 1950-51. (1) The bar graph represents the areas (in lakh hectares) under sugarcane crop during different years in India. (2) It is seen from the bar graph that the area under the sugarcane crop is maximum in the year 1982-83 and minimum in the year 1950-51. (3) The area under the sugarcane crop in the years 1982-83 and 1950-51 are 34 lakh hectares and 18 lakh hectares respectively. Clearly, 34 is not equal to 3 multiplied by 18. (ii) What was the expenditure on health and family planning in the year 1982-83? (iii) In which year is the increase in expenditure maximum over the expenditure in previous year? What is the maximum increase? (1) The bar graph represents the expenditure (in 100 Crores of rupees) on health and family planning during the Sixth Five Year Plan in India. (2) The height of the 2nd bar from the left is 7 units, which is corresponding to the year 1982-83. Hence, the expenditure on health and family planning in the year 1982-83 was 700 Crores rupees. 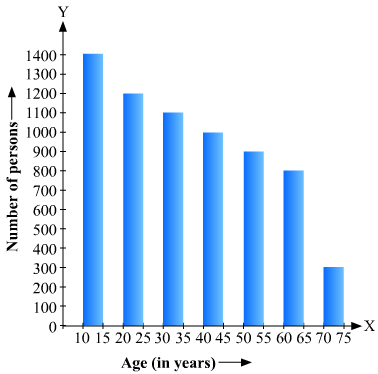 (a) The increase in expenditure in the year 1981-82 is 5 – 4 = 1 unit. 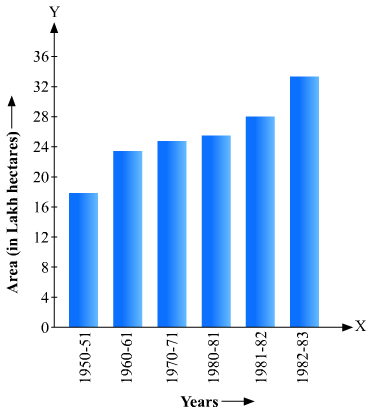 (b) The increase in expenditure in the year 1982-83 is 7 – 5 = 2 units. 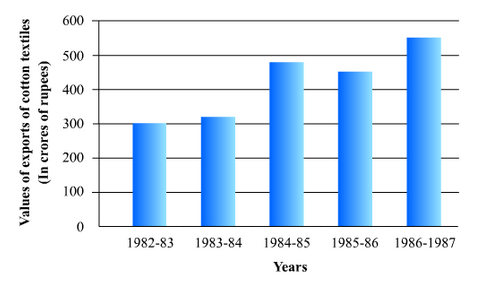 (c) The increase in expenditure in the year 1983-84 is 8 – 7 = 1 unit. 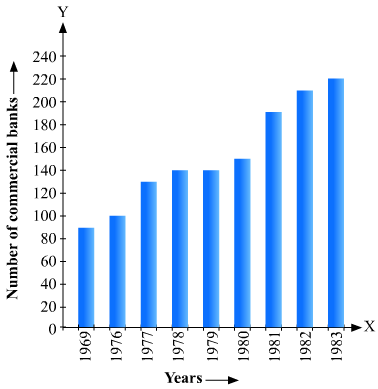 (d) The increase in expenditure in the year 1984-85 is 10.2 – 8 = 2.2 units. (ii) What is the number of families having 6 members? (iii) How many members per family are there in the maximum number of families? Also tell the number of such families. (iv) What are the number of members per family for which the number of families are equal? Also, tell the number of such families? 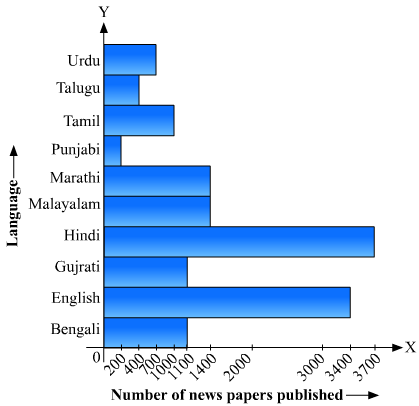 (1) The bar graph represents the number of families with different number of members in a locality. (3) The maximum number of families is 120. There are 3 members per family in the maximum number of families. (4) It is seen from the bar graph that the height of the 9th and 10th bars from the left are same (equals to 5). Hence, the numbers of members per family for which the number of families are equal are 9 and 10. The number of such families is 5. (ii) Which Doordarshan centre covers maximum area? Also tell the covered area. (iii) What is the difference between the areas covered by the centres at Delhi and Bombay? (iv) Which Doordarshan centres are in U.P. State? What are the areas covered by them? 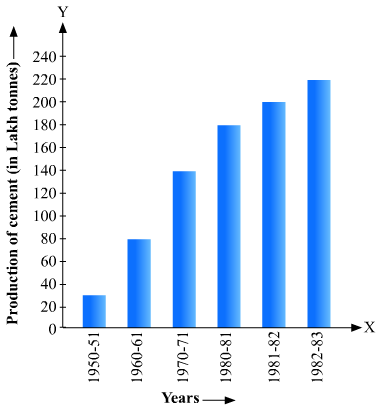 (1) The bar graph represents the area of coverage (in 1000 square km) of some Doordarshan Centers of India. Their difference is 34000 – 20000 = 14000 sq. km. Explain the reading and interpretation of bar graphs. A bar graph is a diagram consisting of a sequence of vertical or horizontal bars or rectangles, each of which represents an equal interval of the values of a variable, and has height proportional to the quantities of the phenomenon under consideration in that interval. 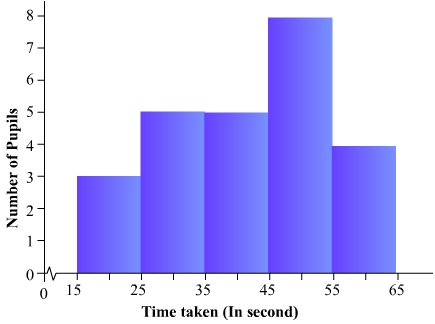 A bar graph may also be used to illustrate discrete data, in which case each bar represents a distinct circumstance. 1. The width of the bars should be uniform throughout. 2. The gap between any two bars should be uniform throughout. 3. Bars may be either horizontal or vertical. Each bar must be of same width and the gap between them must be uniform. Make sure that the width of the bars and the gap between them should not be necessarily same. (ii) In which year the export is minimum? (iii) In which year the import is maximum? (iv) In which year the difference of the values of export and import is maximum? 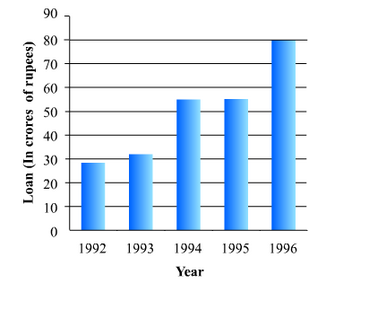 (1) The bar graph represents the import and export (in 100 Crores of rupees) from 1982-83 to 1986-87. (2) The export is minimum in the year 1982-83 as the height of the bar corresponding to export is minimum in the year 1982-83. (3) The import is maximum in the year 1986-87 as the height of the bar corresponding to import is maximum in the year 1986-87. (4) The bars of export and import are side by side. Clearly, it is seen from the bar graph that the difference between the values of export and import is maximum in the year 1986-87. 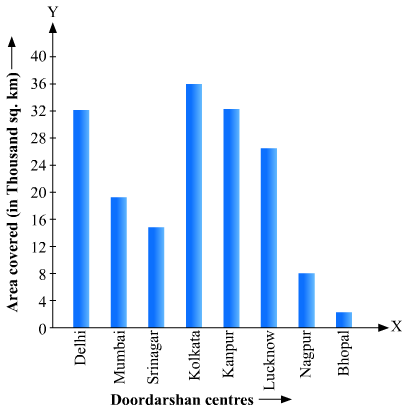 The following bar graph shows the results of an annual examination in a secondary school. (1) The pair of classes in which the results of boys and girls are inversely proportional are VI and IX. So, (b) is the correct option. (3) The sum of the heights of the bars for boys and girls in the class VII is minimum, which is 95 + 40 = 135. Hence, the class having the lowest pass rate is VII. To represent the given data by a vertical bar graph, we first draw horizontal and vertical axes. Let us consider that the horizontal and vertical axes represent the years and the number of applicants registered in thousands respectively. We have to draw 6 bars of different lengths given in the table. At first we mark 6 points in the horizontal axis at equal distances and erect rectangles of the same width at these points. The heights of the rectangles are proportional to the number of applicants registered. Construct a bar graph to represent the above data on a graph paper by using the scale 1 big divisions = 20 thousand tonnes. To represent the given data by a vertical bar graph, we first draw horizontal and vertical axes. Let us consider that the horizontal and vertical axes represent the plants and the production in thousand tonnes respectively. We have to draw 4 bars of different lengths given in the table. The scale 1 big divisions must be 20 thousand tonnes. So, first find the heights of the bars corresponding to different plants. After that, we follow the well known procedure. 1. The height of the bar corresponding to Bhilai is big division. 2. The height of the bar corresponding to Durgapur is big divisions. 3. The height of the bar corresponding to Rourkela is big divisions. 4. 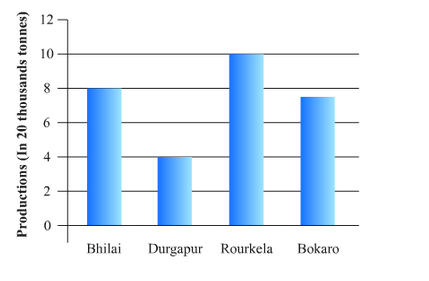 The height of the bar corresponding to Bokaro is big divisions. At first we mark 4 points in the horizontal axis at equal distances and erect rectangles of the same width at these points. The heights of the rectangles are proportional to the productions. Note that the one big division in the vertical axis is equivalent to 20 thousand tonnes. To represent the given data by a vertical bar graph, we first draw horizontal and vertical axes. Let us consider that the horizontal and vertical axes represent the years and the route lengths in thousand km respectively. We have to draw 5 bars of different lengths given in the table. At first we mark 5 points in the horizontal axis at equal distances and erect rectangles of the same width at these points. The heights of the rectangles are proportional to the route lengths. To represent the given data by a vertical bar graph, we first draw horizontal and vertical axes. Let us consider that the horizontal and vertical axes represent the years and the amount of loan in Crores of rupees respectively. We have to draw 5 bars of different lengths given in the table. At first we mark 5 points in the horizontal axis at equal distances and erect rectangles of the same width at these points. The heights of the rectangles are proportional to the amount of loan disbursed by the bank. 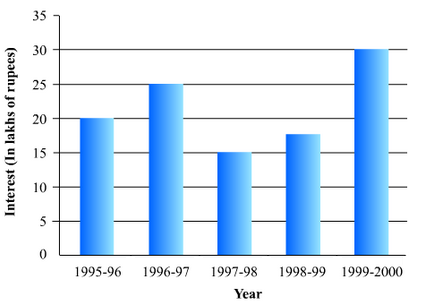 (2) It is seen from the bar graph that the heights of the bars in the years 1994 and 1995 are same. Hence, the amount of loan is not increased in the year 1995 over the preceding year 1994. To represent the given data by a vertical bar graph, we first draw horizontal and vertical axes. Let us consider that the horizontal and vertical axes represent the years and the interests in lakhs of rupees respectively. We have to draw 5 bars of different lengths given in the table. At first we mark 5 points in the horizontal axis at equal distances and erect rectangles of the same width at these points. The heights of the rectangles are proportional to the interests paid by the company. To represent the given data by a vertical bar graph, we first draw horizontal and vertical axes. Let us consider that the horizontal and vertical axes represent the countries and the average age of men’s respectively. We have to draw 6 bars of different lengths given in the table. At first we mark 6 points in the horizontal axis at equal distances and erect rectangles of the same width at these points. The heights of the rectangles are proportional to the average age of men’s in different countries. Represent the above with the help of a bar graph. To represent the given data by a vertical bar graph, we first draw horizontal and vertical axes. Let us consider that the horizontal and vertical axes represent the years and the production of food grains in thousand tonnes respectively. We have to draw 6 bars of different lengths given in the table. At first we mark 6 points in the horizontal axis at equal distances and erect rectangles of the same width at these points. The heights of the rectangles are proportional to the production of food grains. 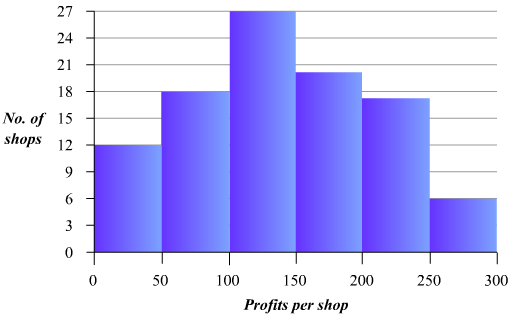 (ii) Indicate with the help of the bar graph the year in which the amount of manufactured by the company was maximum. To represent the given data by a vertical bar graph, we first draw horizontal and vertical axes. Let us consider that the horizontal and vertical axes represent the years and the amount of manure in thousand 9 ones respectively. We have to draw 6 bars of different lengths given in the table. At first we mark 6 points in the horizontal axis at equal distances and erect rectangles of the same width at these points. The heights of the rectangles are proportional to the amount of manures manufactured by the company. 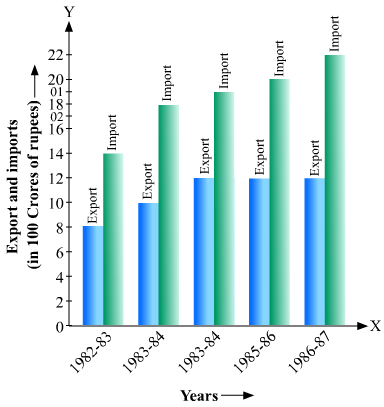 (2) It is seen from the bar graph that the height of the 3rd bar from the left is maximum, which is corresponding to the year 1994. So in 1994 the quantity manufactured by the company was maximum. 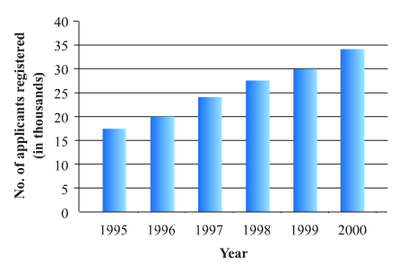 (3) It is seen from the bar graph that the manure production is decreased in the years 1995 (1.5 scale divisions) and 1997 (2 full scale divisions). So, the maximum decrease is in the year 1997. Represent the data with the help of a bar graph. Indicate with the help of the bar graph the course where estimated requirement is least. To represent the given data by a vertical bar graph, we first draw horizontal and vertical axes. Let us consider that the horizontal and vertical axes represent the qualifications and the personnel required in hundreds respectively. We have to draw 5 bars of different lengths given in the table. At first we mark 5 points in the horizontal axis at equal distances and erect rectangles of the same width at these points. 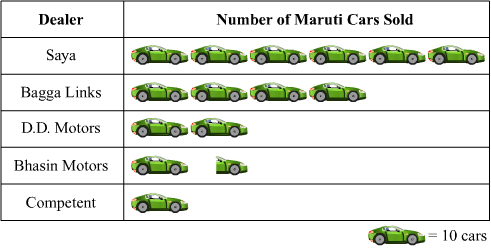 The heights of the rectangles are proportional to the number of personnel required. It is seen from the bar graph that the height of the 3rd bar from the left is least, which is corresponding to DCE. Hence, the requirement is least in DCE. 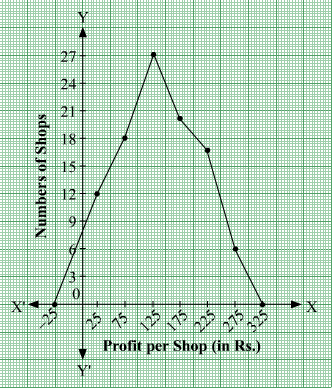 Represent the above data by a gar graph. To represent the given data by a vertical bar graph, we first draw horizontal and vertical axes. Let us consider that the horizontal and vertical axes represent the years and the income or expenditure in thousand rupees respectively. We have to draw 5 bars for each income and expenditure side by side of different lengths given in the table. At first we mark 5 points for each income and expenditure in the horizontal axis at equal distances and erect rectangles of the same width at these points. The heights of the rectangles are proportional to the corresponding income or expenditures. Represent the above data with the help of bar graph. To represent the given data by a vertical bar graph, we first draw horizontal and vertical axes. Let us consider that the horizontal and vertical axes represent the sectors and the investment in ten Crores of rupees respectively. We have to draw 6 bars of different lengths given in the table. At first we mark 6 points in the horizontal axis at equal distances and erect rectangles of the same width at these points. The heights of the rectangles are proportional to the investments of Life Insurance Corporation of India. Represent the above data with the help of a bar graph. 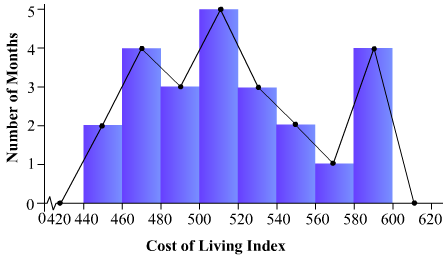 Indicate with the help of a bar graph the year in which the rate of increase in exports is maximum over the preceding year. To represent the given data by a vertical bar graph, we first draw horizontal and vertical axes. Let us consider that the horizontal and vertical axes represent the years and the value of Indian export of cotton textiles in Crores of rupees respectively. We have to draw 5 bars of different lengths given in the table. At first we mark 5 points in the horizontal axis at equal distances and erect rectangles of the same width at these points. The heights of the rectangles are proportional to the values of Indian export of cotton textiles in different years. Hence, in the year 1984-85 the rate of increase of export is the maximum over the preceding year. Represent this information with the help of a bar graph. Explain through the bar graph if the quantity of goods carried by the Indian Railways in 1965-66 is more than double the quantity of goods carried in the year 1950-51. To represent the given data by a vertical bar graph, we first draw horizontal and vertical axes. Let us consider that the horizontal and vertical axes represent the years and the quantity of goods in crores tonnes respectively. We have to draw 6 bars of different lengths given in the table. The heights of the rectangles are proportional to the quantity of goods carried by Indian railways in different years. It is seen from the bar graph that the quantity of goods carried in the years 1950-51 and 1965-66 are 20 Crores tonnes and 9 Crores tonnes. Clearly 20 is more than 2 multiplied by 9. 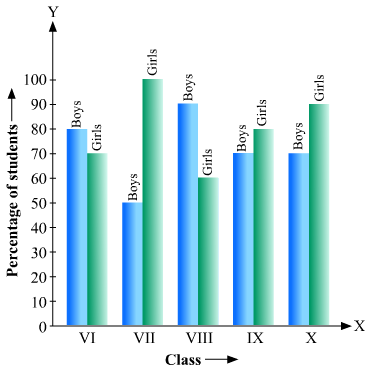 Construct a bar graph to represent the above data so that the bars are drawn horizontally. To represent the given data by a vertical bar graph, we first draw horizontal and vertical axes. Let us consider that the vertical and horizontal axes representing the refineries and the production of oil in lakh tonnes respectively. We have to draw 5 bars of different lengths given in the table. At first we mark 5 points in the vertical axis at equal distances and erect rectangles of the same width at these points. The lengths of the rectangles are proportional to the productions of oil. To represent the given data by a vertical bar graph, we first draw horizontal and vertical axes. Let us consider that the horizontal and vertical axes representing the years and the expenditures on health in 10 crores of rupees respectively. We have to draw 6 bars of different lengths given in the table. At first we mark 6 points in the horizontal axis at equal distances and erect rectangles of the same width at these points. The heights of the rectangles are proportional to the expenditures on health by the government of India in different years. To represent the given data by a histogram, we first draw horizontal and vertical axes. Let us consider that the horizontal and vertical axes represent the class-limits and the frequencies of the class-intervals respectively. The given data is a continuous grouped frequency distribution with equal class-intervals. Construct rectangles with class-intervals as bases and respective frequencies as heights. It should be noted that the scale for horizontal axis may not be same as the scale for vertical axis. Let us take one vertical division is equal to 3 rupees. 1. The height of the rectangle corresponding to the class-interval 30-60 is big divisions. 2. The height of the rectangle corresponding to the class-interval 60-90 is big divisions. 3. The height of the rectangle corresponding to the class-interval 90-120 is big divisions. 4. The height of the rectangle corresponding to the class-interval 120-150 is big divisions. 5. The height of the rectangle corresponding to the class-interval 150-180 is big divisions. 6. The height of the rectangle corresponding to the class-interval 180-210 is big divisions. 7. The height of the rectangle corresponding to the class-interval 210-240 is big divisions. 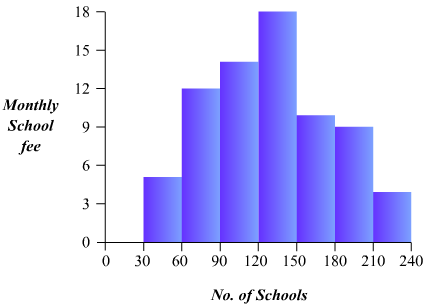 The distribution of heights (in cm) of 96 children is given below. 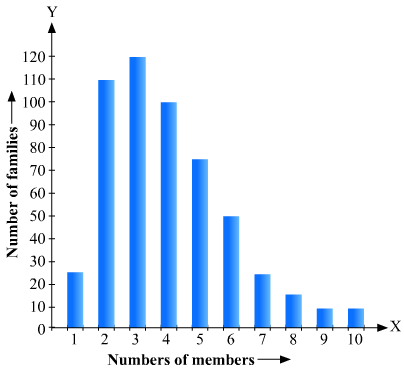 Construct a histogram and a frequency polygon on the same axes. The given data is a continuous grouped frequency distribution with equal class-intervals. Construct rectangles with class-intervals as bases and respective frequencies as heights. To draw the frequency polygon of the given data using histogram, obtain the mid-points of the upper horizontal side of each rectangle and then join these mid-points of the adjacent rectangles of the histogram by line segments. Obtain the mid-points of two class-intervals of 0 frequencies, i.e. on the horizontal axis, one adjacent to the first, on its left and one adjacent to the last, on its right. These class-intervals are known as imagined class-intervals. Complete the polygon by joining the mid-points of first and last class-intervals to the mid-points of imagined class-intervals adjacent to them. Let us take one vertical division is equal to 4. 2. The height of the rectangle corresponding to the class-interval 128-132 is big divisions. 4. The height of the rectangle corresponding to the class-interval 136-140 is big divisions. 5. The height of the rectangle corresponding to the class-interval 140-144 is big divisions. 6. The height of the rectangle corresponding to the class-interval 144-148 is big divisions. 7. The height of the rectangle corresponding to the class-interval 148-152 is big divisions. 8. The height of the rectangle corresponding to the class-interval 152-156 is big divisions. 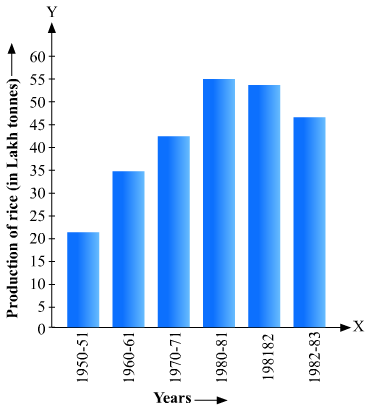 (a) Construct a frequency distribution for these data, using a class interval of 10 seconds. Given that the times (in seconds) taken to solve a problem by each of 25 pupils are 16, 20, 26, 27, 28, 30, 33, 37, 38, 40, 42, 43, 46, 46, 46, 48, 49, 50, 53, 58, 59, 60, 64, 52 and 20. The minimum and maximum time values are 16 and 64 respectively. 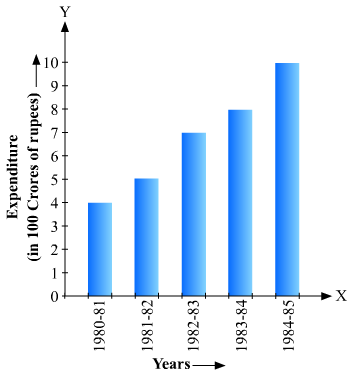 (a) At first construct the following frequency distribution for the given data. Since, the lowest value is 16; we start with the class-interval 15-25, as the class size must be 10. 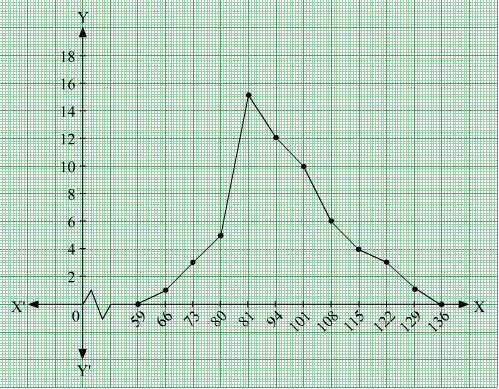 (b) To represent the given data by a histogram, we first draw horizontal and vertical axes. Let us consider that the horizontal and vertical axes represent the class-limits and the frequencies of the class-intervals respectively. The above data is a continuous grouped frequency distribution with equal class-intervals, which is 10. Construct rectangles with class-intervals as bases and respective frequencies as heights. The given data is a continuous grouped frequency distribution with equal class-intervals. Construct rectangles with class-intervals as bases and respective frequencies as heights. It should be noted that the scale for horizontal axis may not be same as the scale for vertical axis. To draw the frequency polygon of the given data using histogram, obtain the mid-points of the upper horizontal side of each rectangle and then join these mid-points of the adjacent rectangles of the histogram by line segments. Obtain the mid-points of two class-intervals of 0 frequencies, i.e. on the horizontal axis, one adjacent to the first, on its left and one adjacent to the last, on its right. These class-intervals are known as imagined class-intervals. Complete the polygon by joining the mid-points of first and last class-intervals to the mid-points of imagined class-intervals adjacent to them. Let us take one vertical division is equal to 1 month. 1. The height of the rectangle corresponding to the class-interval 440-460 is 2 big divisions. 2. The height of the rectangle corresponding to the class-interval 460-480 is 4 big divisions. 3. The height of the rectangle corresponding to the class-interval 480-500 is 3 big divisions. 4. The height of the rectangle corresponding to the class-interval 500-520 is 5 big divisions. 5. The height of the rectangle corresponding to the class-interval 520-540 is 3 big divisions. 6. The height of the rectangle corresponding to the class-interval 540-560 is 2 big divisions. 7. The height of the rectangle corresponding to the class-interval 560-580is 1 big division. 8. The height of the rectangle corresponding to the class-interval 580-600 is 4 big divisions. The given data is a continuous grouped frequency distribution with equal class-intervals. Construct rectangles with class-intervals as bases and respective frequencies as heights. It should be noted that the scale for horizontal axis may not be same as the scale for vertical axis. To draw the frequency polygon of the given data using histogram, obtain the mid-points of the upper horizontal side of each rectangle and then join these mid-points of the adjacent rectangles of the histogram by line segments. Obtain the mid-points of two class-intervals of 0 frequencies, i.e. on the horizontal axis, one adjacent to the first, on its left and one adjacent to the last, on its right. These class-intervals are known as imagined class-intervals. Complete the polygon by joining the mid-points of first and last class-intervals to the mid-points of imagined class-intervals adjacent to them. Let us take one vertical division is equal to 5 workers. 1. The height of the rectangle corresponding to the class-interval 100-150 is big divisions. 2. The height of the rectangle corresponding to the class-interval 150-200 is big divisions. 5. The height of the rectangle corresponding to the class-interval 300-350 is big divisions. 7. The height of the rectangle corresponding to the class-interval 400-450 is big division. 8. The height of the rectangle corresponding to the class-interval 450-500 is big divisions. Draw a frequency polygon for the above data. We first draw horizontal and vertical axes. Let us consider that the horizontal and vertical axes represent the class-limits and the frequencies of the class-intervals respectively. The given data is a continuous grouped frequency distribution with equal class-intervals. To draw the frequency polygon of the given data without using histogram, obtain the class-limits of the class intervals. Obtain the class-limits of two class-intervals of 0 frequencies, i.e. on the horizontal axis, one adjacent to the first, on its left and one adjacent to the last, on its right. These class-intervals are known as imagined class-intervals. Then plot the frequencies against class-limits. The following table is useful to draw the frequency polygon of the given data. We represent class marks on X-axis on a suitable scale and the frequencies on Y-axis on a suitable scale. To obtain the frequency polygon we plot the points (66, 1), (73, 3), (80, 5), (87, 15), (94, 12), (101, 10), (108, 6), (115, 4), (122, 3), (129, 1). Now we join the plotted points by line segments. The end points (66, 1) and (129, 1) are joined to the mid points (59, 0) and ( 136, 0) respectively of imagined class intervals to obtain the frequency polygon. To represent the given data by a histogram, we first draw horizontal and vertical axes. Let us consider that the horizontal and vertical axes represent the class-intervals and the frequencies of the class-intervals respectively. The given data is a continuous grouped frequency distribution with equal class-intervals. Construct rectangles with class-intervals as bases and respective frequencies as heights. The scale for horizontal axis may not be same as the scale for vertical axis. Let us take one vertical division is equal to 1 unit. 1. The height of the rectangle corresponding to the class-interval 450-500 is 16 big divisions. 2. The height of the rectangle corresponding to the class-interval 500-550 is 10 big divisions. 3. The height of the rectangle corresponding to the class-interval 550-600 is 7 big divisions. 4. The height of the rectangle corresponding to the class-interval 600-650 is 3 big divisions. 5. The height of the rectangle corresponding to the class-interval 650-700is 1 big divisions. To represent the given data by a histogram, we first draw horizontal and vertical axes. Let us consider that the horizontal and vertical axes represent the class-intyervals and the frequencies of the class-intervals respectively. The given data is a continuous grouped frequency distribution with equal class-intervals. Construct rectangles with class-intervals as bases and respective frequencies as heights. The scale for horizontal axis may not be same as the scale for vertical axis. Let us take one vertical division is equal to 3 shops. 1. The height of the rectangle corresponding to the class-interval 0-50 is big divisions. 2. The height of the rectangle corresponding to the class-interval 50-100 is big divisions. 3. The height of the rectangle corresponding to the class-interval 100-150 is big divisions. 6. The height of the rectangle corresponding to the class-interval 250-300 is big divisions. 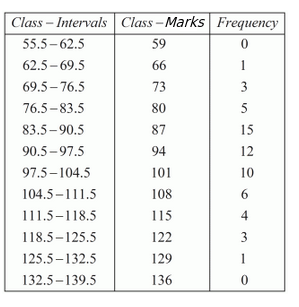 For frquency polygon, first we will obtain the class marks as given in the following table. We plot the points (25, 12), (75, 18), (125, 27), (175, 20), (225, 17) and (275, 6). Now, we join the plotted points by line segments . The end points (25, 12) and (275, 6) are joined to the mid-points (−25, 0) and (325, 0) respectively of imagined class-intervals to obtain the frequency polygon. We know that bar graph, histogram and frequency polygons are all graphical representation of statistical data. 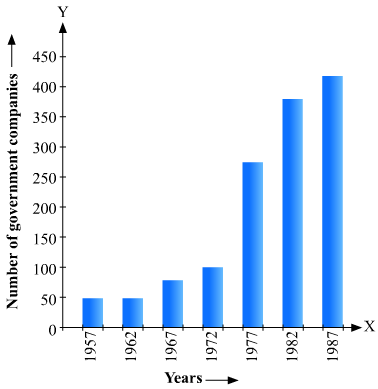 In a frequency distribution, ogives are graphical representation of cumulative frequency. Frequency polygon is the plot of frequencies vs. the mid values of the classes. 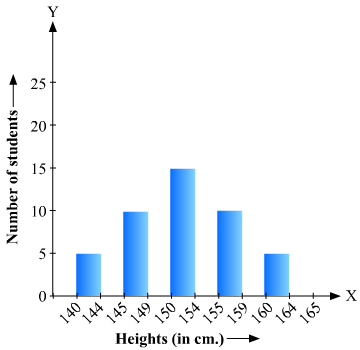 In a histogram the area of each rectangle is proportional to the frequency of the corresponding class interval. In the less than type of ogive the cumulative frequency is plotted against the upper limit of the concerned class interval. 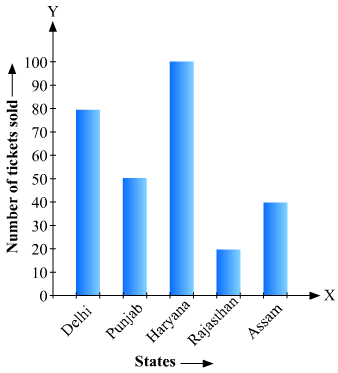 In a histogram the class intervals or the groups are taken along the horizontal axis or X−axis. 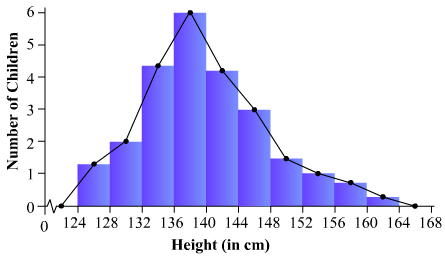 In a histogram the class intervals and frequencies are taken along horizontal and vertical axes respectively. 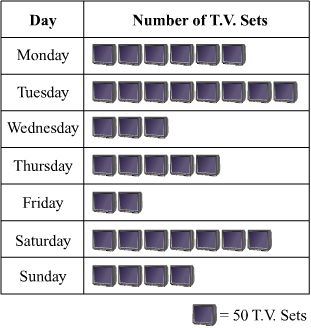 In a histogram, the class rectangles are constructed with base as the class−intervals. To represent the given data by a vertical bar graph, we first draw horizontal and vertical axes. 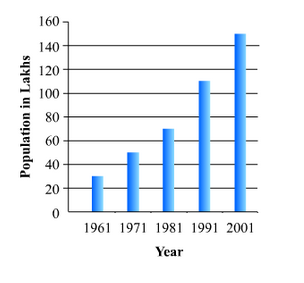 Let us consider that the horizontal and vertical axes represent the years and the population in lakhs respectively. We have to draw 5 bars of different heights given in the table. At first we mark 5 points in the horizontal axis at equal distances and erect rectangles of the same width at these points. The heights of the rectangles are proportional to the population in lakhs. Note that each bar is of same width and the gap between them is uniform. Make sure that the width of the bars and the gap between them should not be necessarily same. (ii) How many tickets of Assam State Lottery were sold by the agent? (iii) Of which state, were the maximum number of tickets sold? (v) Of which state were the minimum number of tickets sold? 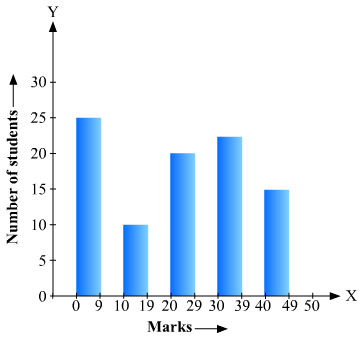 (1) The bar graph represents the number of tickets of different state lotteries sold by an agent on a day. (2) The number of tickets of Assam State Lottery were sold by the agent is 40. (3) The maximum numbers of tickets were sold is 100, in the state Haryana. (4) The maximum number of tickets were sold is 100, in the state Haryana. The minimum number of tickets were sold is 20, in the state Rajasthan. It is clear that 100 are equal to the 5 times of 20. Hence, the statement is false. (5) The minimum numbers of tickets were sold is 20, in the state Rajasthan. (i) What is the percentage of the youngest age-group persons over those in the oldest age group? (iii) What is the number of persons in the age-group 60-65? (iv) How many persons are more in the age-group 10-15 than in the age group 30-35? (v) What is the age-group of exactly 1200 persons living in the town? (vi) What is the total number of persons living in the town in the age-group 50-55? (vii) What is the total number of persons living in the town in the age-groups 10-15 and 60-65? (vii) Whether the population in general increases, decreases or remains constant with the increase in the age-group. (3) The number of persons in the age group 60-65 is 800. (5) The age group of 1200 persons living in the town is 20-25. (6) The total number of persons living in the town in the age-group 50-55 is 900. 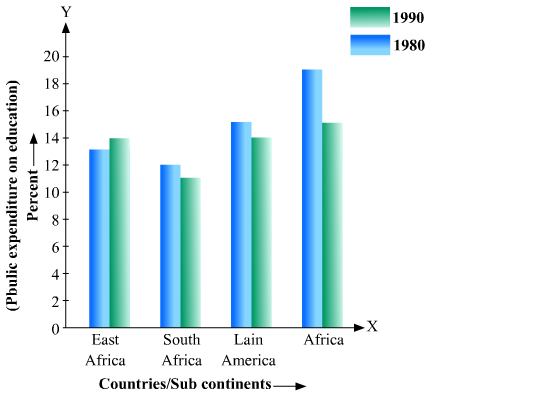 (8) It is shown from the bar graph that the height of the bars decreases as the age-group increases. Hence, the population decreases with the increases in the age-group. (1) The bar graph represents the number of commercial banks in India during some particular years. Clearly, 230 is not less than 180. Hence the statement is false.